Without plumbing systems, your home would be a very simplistic place. With no central heating or water supply, you wouldn’t be able to do half of the things that you do now. Which is why you need to avoid crossing paths with any plumbing issues that could damage your home’s plumbing system. Some plumbing problems that occur in your home, aren’t necessarily going to cause problems in your everyday life. In fact, you might not even notice anything is wrong until you receive your next water bill and realise the price has skyrocketed. However, there are a variety of home plumbing issues that are extremely dangerous and can only be diagnosed and repaired by professional plumbers Milton Keynes. You should never attempt to make any repairs or replacements yourself as it can end up in serious injury, or worsen the condition of your home’s plumbing. So if you are worried about your home’s plumbing system, we’ve listed some of the most common home plumbing issues that can affect your property. Low water pressure is most likely one of the simplest plumbing issues to notice. If your shower or taps are releasing only small trickling amount of water, it’s evident that there’s a problem. This could be down to hard water or a blockage, so it’s definitely worth being seen to. The culprit of trickling water could also be corroded or leaking pipes that aren’t allowing your water flow to reach full capacity. In situations such as with your showerhead, the water chutes could be blocked up with hard water; these can be removed by gently scraping out the calcified minerals with a toothpick. If you don’t feel comfortable doing this or it’s a regular occurrence, contact your local plumber and arrange the installation of a water softener or showerhead replacement. A running toilet is one of the biggest causes of water loss and can use up gallons of water a day without you even being aware. Most of the time this problem is down to a faulty or dislodged flapper valve – which is in control of the water that flows from your toilet tank to the bowl. Not only does this cause significant water loss, but it creates an annoying trickling water noise that can go on for hours after you have flushed your toilet. Once again we recommend contacting a professional to carry out repairs as this can be a complicated issue to fix. Sewage back up’s are a ghastly experience that needs professional attendance straight away. Whether it be your pipework or toilet system that backs up, you can flood your entire home and become susceptible to water damage if you don’t act fast. Most of the time sewage back up’s are due to clogs and blockages, which can be down to flushing foreign objects that cannot be broken down down the toilet. As well as this, tree roots growing have been known to puncture or damage under home plumbing systems so if you are very strict with what goes own the toilet, this could be your problem, or just simple old faulty sewer lines. Either way, contact plumbers immediately as human waste in your home can spread illness and disease and water damage acts extremely fast within your property. Read here to see the effects water damage has on your home. When your boilers on the blink it makes life very complicated with no access to hot water. A faulty water heater is often caused by your pilot light going out, sediment collecting or a defective thermostat. Boiler faults no matter how simple or complicated should never be attempted by anyone other than a qualified professional, boiler repairs Towcester are needed and you should contact your local plumber for pricing and availabilities. Always fix boiler faults as soon as you find them, as a prolonged faulty boiler can cause the production of harmful gases like Carbon Monoxide, or cause the need for costly repairs or entire boiler replacements. Not only a water wasting issue, but an extremely irritating one. Dripping taps cause constant dripping noises and can add extra costs onto your water bills. This problem could be down to the internal washer becoming torn, worn out, stiff or even dislodged. Dripping taps are a simple issue to fix, and if you wanted can even be carried out at home by yourself. Check out here how you can fix your leaky taps. You will notice a clogged toilet almost immediately. When you flush the water will back up to the top of the bowl, and anything in the toilet will not flush. This can once again be down to flushing unsuitable objects down the toilet, or in some circumstances can also be due to the collection of calcified sediment that can cause blockages. Using a drain snake or a plunger you can dislodge the cause of the blockage and remove it from your toilet, unless it’s deep within the pipework. If you think this is the case, then ask a professional otherwise you could fix the issue yourself if you wanted to. This happens commonly in bathrooms as well as kitchens. It’s easy enough for your plughole to become full with dirt, grime, fats, oils, beauty products and even hair. Unfortunately, your drains do not have a self-cleaning system so in order to keep them in working order you must regularly clean them and unblock them. If your drains are draining slowly, we recommend using a drain snake, a plunger, a chemical clog removing product or even a concoction of baking soda, vinegar and water. Any of these methods are effective in cleaning and unclogging, but if you have any indication that the issue is more serious do not hesitate to call an emergency plumber. 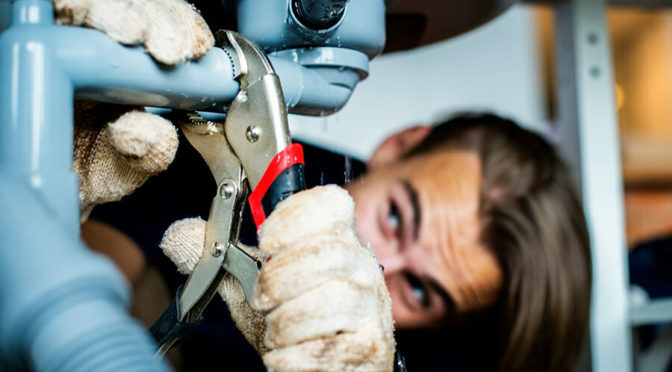 Now you know the most common home plumbing issues it’s time to put prevention methods into place to stop your home’s plumbing work becoming damaged or blocked. We hope that this article was helpful. If it was then why not share on social media, we would be very grateful.